SCM system is considered the holy grail of supply chain management. Anyway, we will show 7 lessons from the world's largest scm system implementation project. In 1998 US Navy realized that their existing enterprise system which consisted of 44 subsystems were disparate and they needed a more integrated system in order to cope with modern warfare. As a result, they planned the new enterprise system and the first pilot project started in the fiscal year 2000. Unfortunately, they found that a new system didn't meet their requirements and the price tag of this failure was $1 billion, the most expensive ERP project that fails! Implementation of the new ERP system at the Navy consisted of 4 separate ERP systems and each system had the overlapping functionality. The reason was that each project was funded and managed by the different commands within the Navy without coordination. In a typical project, the whole system is not that big but the lack of centralized management still persists. 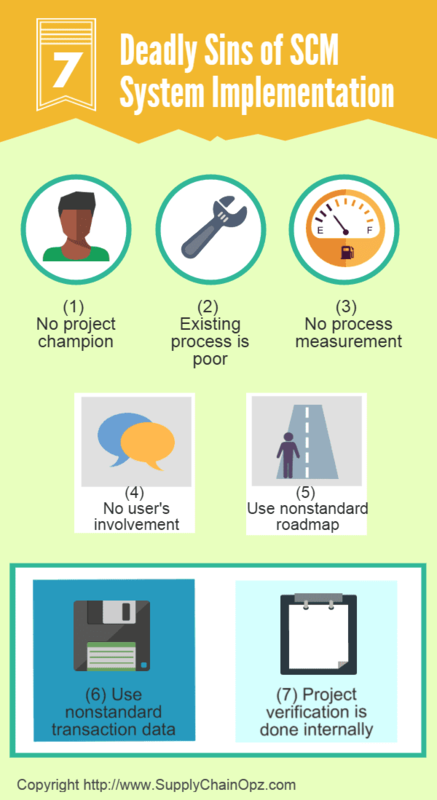 The project champion is usually someone with a big job title or someone who is not busy. The project is never be entrusted to the knowledgeable person. ERP usually comes with a standardized process aimed to increase efficiency. Anyway, the Navy tried to stick to the way the process was performed manually or by the legacy system. Then, there were too many kinds of workflows for each type of transaction under the new system. GOA reported that the investment in a new system created "no marked improvement in the Navy's day-to-day operations". Part of the reason is that there was no appropriate process metrics so they couldn't determine the performance before and after implementation. The Navy didn't ask the end users for the input, nor it made sure that the system requirements were complete, correct and understandable. All decisions were made by top management. That's why the new system couldn't satisfy the needs of most end users. People familiar with the project said that it could have been better if they had used the implementation methodology of software vendors rather than that of the system integrators/consultants. The reason is that vendors know how to configure the system the most and this could have minimized the risks associated with a project. Many users needed the data in a very specific format so many customizations were required and this increased the level of complexity and development cost. The Navy could have prevented a project delay if they had requested the external experts to help with the verification of project activities. This concept is very similar to a financial audit. Surprising shocking, the above-mentioned points are the generic "critical success factors" in an ERP project that will be readily available, what you have to do is just to google it. The moral of this story is "stitch in time saves nine". - Kutz, G. D., & Rhodes, K. A. (2006). DOD business systems modernization: Navy ERP adherence to best business practices critical to avoid past failures. DIANE Publishing. - Ross, J. W., & Weill, P. (2002). Six IT decisions your IT people shouldn't make. Harvard business review, 80(11), 84-95.